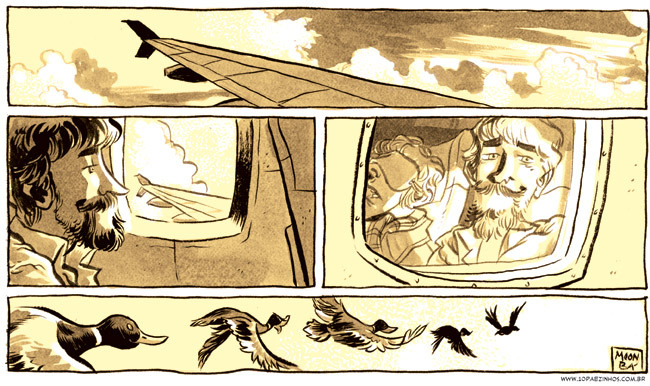 We've been working on many amazing comics, and have almost abandoned this blog. Also, because of the easy interactivity with instagram, twitter and facebook, we have been posting stuff more frequently on our tumblr page – YES, we have a tumblr page – and I'm debating if I should cease to write stuff here and just migrate there altogether. One of the surprises 2015 will bring, I guess. Be safe, be happy, and dream. Let's continue making dreams come to life next year. 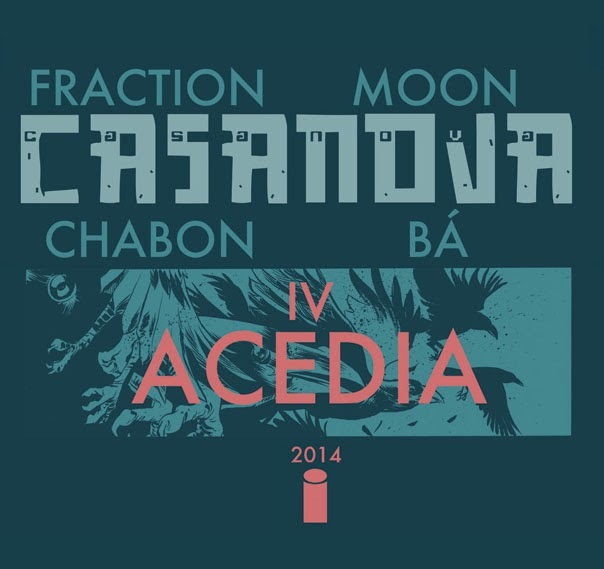 As the solicitations for all Image comics coming out in January 2015 went online, some people noticed (and helped spread the word) that Casanova is coming back with the first issue of our forth volume, Acedia. I'm again handling the art, trying to out crazy my brother's pages from Avaritia while at the same being time haunted by his presence as he'll also contribute to each issue drawing the back stories (written by Michael Chabon). 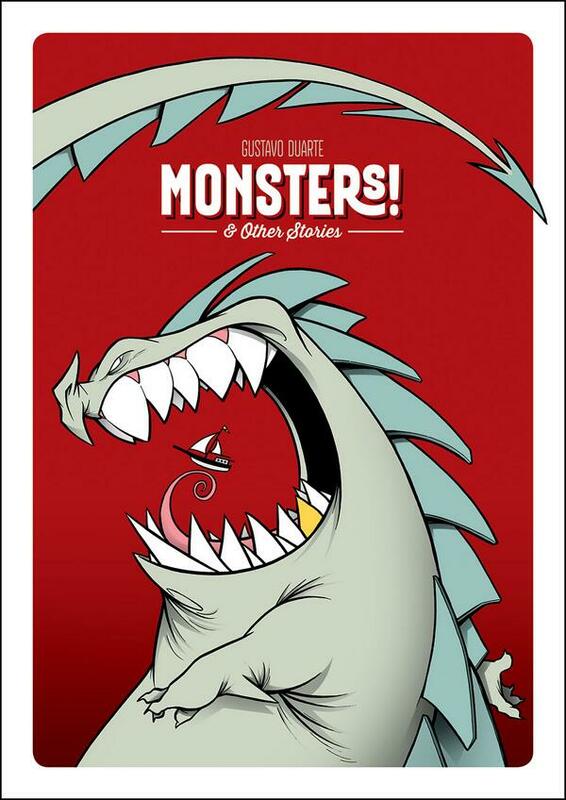 Things will be crazy, and they'll get crazier, and here's the cover of issue 1. 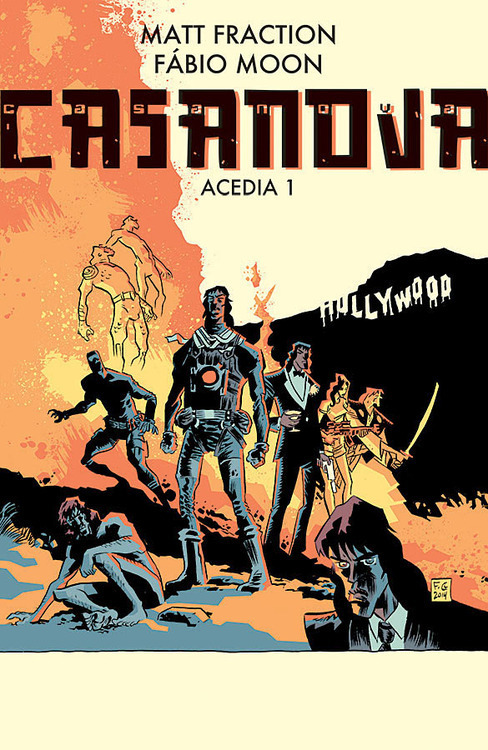 Marooned in Los Angeles with no memory of his past, Casanova Quinn takes on the mystery of his criminal benefactor’s tangled and bloody history—as strange occult forces from the future conspire to… do stuff? To him? To Los Angeles? To you? YES. Featuring the first in a series of backup stories by Pulitzer Prize winner MICHAEL CHABON and CASANOVA co-creator GABRIEL BÁ. Bright yellows and oranges, and a lot of greys. That's what you can expect on the inside. 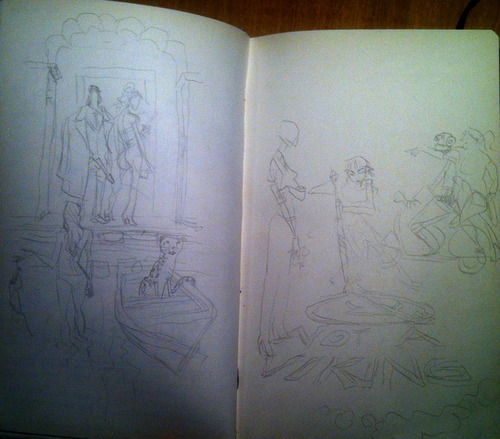 The funny thing about this cover is the fact that I drew it during a blackout. I was hard at work on issue 2, but the cover deadline was looming on me, and I ended up leaving it for the last minute (as most of us do), so I was drawing it one night and my entire block went dark. I waited for a little bit, no sign of the lights coming back, and I started to worry. The lights didn't come back, so I had to improvise. 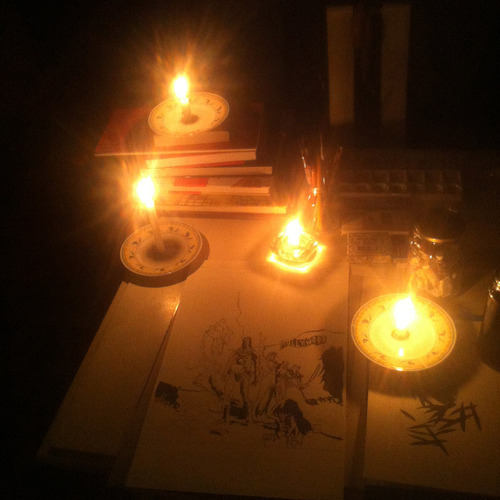 Luckily, I had some candles at home. "jeez, you should work in the dark all the time." We've began this tradition in 2005, when Fábio finished Smoke and Guns. On the day he drew the last pages of the story, he came wearing a suit, as a way of remembering that day, making it special. He did it again in 2006 on the last day drawing The Alienist. Again in 2008, when he finished Casanova: GULA. Every new big story he finished, he'd have a suit day on the last day of the work. 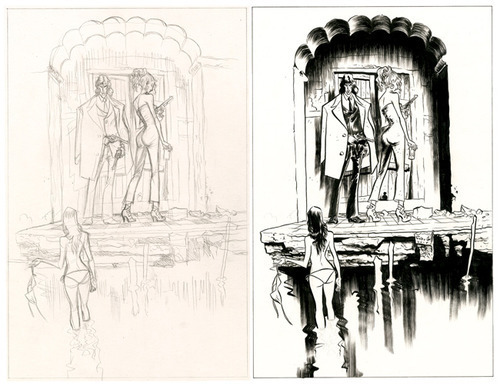 Our last suit day was July 19th, 2010, in London, when he drew the last page of Daytripper. Today is another memorable day, as we finished our new book, Two Brothers. Both of us dressed accordingly. It's a very special day. Another year, another San Diego Comic Con. The convention keeps taking over the town, so there's stuff going on everywhere around the Gaslamp quarter. If you want to catch up with me and get somes books signed, this is my schedule for this year. Before preview night actually starts, I think the action happens at the Hilton Bayfront, where there'll be an Image Expo presentation starting at 2pm. Image has been releasing so many great new books by some awesome creators, that I'm really looking forward to what they might announce this time. I'll be signing all the books you can bring at the Vertigo signing table, so don't be shy. You know those art demonstrations they have at the DC booth, where they interview an artist while he/she's drawing, right then and there, and they shoot the drawing being made and project it live on a big screen? So, those. With me. At night, probably around 8pm, there's the traditional CBLDF party at the terrace of the Westgate hotel. Many artists will attend and it's a great chance to meet and talk to them, and to look at a lot of the great original art that will be available at the CBLDF auction over the weekend. I don't have any signings or panels, so I'll be free to actually see some stuff at the convention. I plan on catching up with some friends and seeing some panels. At night, I'll go to the Eisner Awards ceremony, which starts at 8pm at the Hilton Bayfront. I have a bunch of friends nominated and I'll be rooting for them while we all join in the celebration of our medium. Whatever happens, afterwards we'll party! Hangover signing! I'll be signing all the books you can bring at the Vertigo signing table, so don't be shy. I'll be shy for the both of us, okay? Also, this is my last signing this year, so don't leave anything for Sunday. Another day without signings or panels for me, so I hope you enjoy the last day of the convention. I know I will. And I'll definitely do an "art hunt" on Sunday for those who stick until the end. Bá and I work on many projects at the same time. Part as a result of being a freelancer and thinking we have to accept every offer we get ( dreading not having any after we finish the current book), and part just because there are projects, invitations and people who want to collaborate with us that we can't simply say no – they're too good to pass –, we end up working on many things, some big, some small, some writing for ourselves to draw, and some drawing what others have written. So, from time to time, when we finish something and have a little time to step back and look at what we're doing... well, to look at our drawing board, then we get so see some of these many facets of the delicate crystal we work on. Tonight, I finished the first draft of a new script and sent it over to the editor. That's the high point of my week – the awful game on tuesday being the low – so I stepped back and tried to look at my drawing board. My sketchbook has a figure drawing of a woman from last year's class I gave (I have something I can't show yet on another page, so I flipped it to that page to take this picture). On the top left, I have some bookplates left for the BPRD: Vampire TPB that we did for Gosh. I started to sort out original art to take with me to San Diego for Comic Con, and that's why the Killjoys variant cover I did is there, looking right at us. The bottom left is what's left of color studies and preparation for coloring my story for the Magenta issue of the CMYK Vertigo Quarterly anthology. 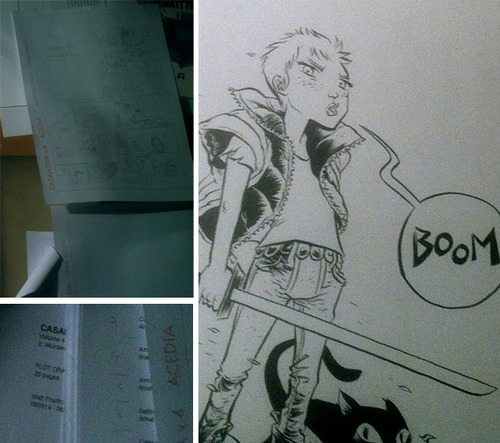 On the right, the script and the layouts of Casanova 4.2, which I'm working on and am afraid I'm a little late. Back to work. It doesn't really matter if you work on one project, or on many. If you believe in what you're doing, it's all worth it, and you should give it everything you have. At the end of next week, once again we'll go exploring. This week, both Bá and I did new original drawings for the annual CBLDF auction that takes place in San Diego during Comic Con. We took some time from our crazy-busy schedules (made even crazier by the fact that World Cup is going on just outside our studio window) and created two new images with characters we have created. TFAW, who always helps coordinate this, will make prints of the images that the artists will be able to keep and sell, so I decided to make a full color image that would make a great 10 x 17 print. My first idea was to do a Sugarshock image. Everybody seems to really love those characters, and you could say that right now Joss Whedon, writer of Sugarshock and nowadays writer and director of the Avengers movies, has never been as popular. I sketched the characters on my notebook and started working on the final image, but something wasn't clicking and I wasn't happy with where I was going with the drawing. I decided to call it a day and get back to it the next morning, and I'm glad I did. Next morning, I went looking for inspiration at one of my sources: Pinterest. I used to keep thousands of images in folders on my computer, but nowadays it's much easier to keep everything I think might inspire an illustration or a story on my Pinterest page. 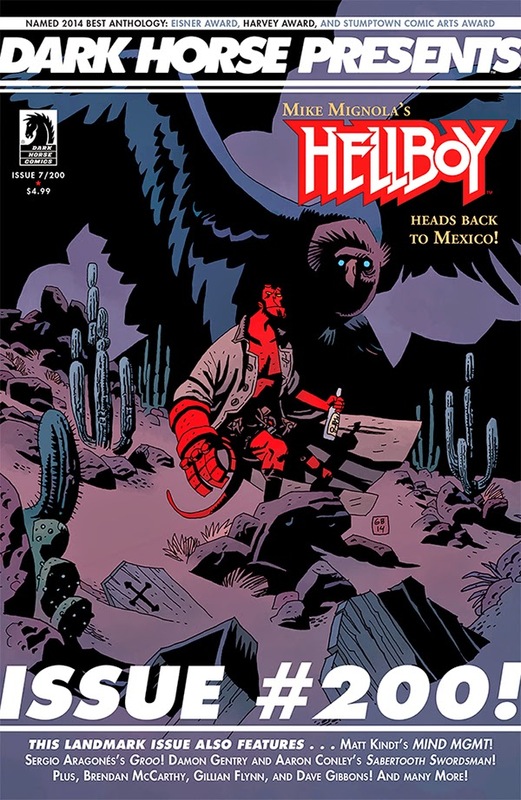 If you go check it out, you'll find elements of my recent CMKY stories for Vertigo, as well as research for the short Hellboy story, and many other images from across the internet that I keep in handy to mix up in my head when I'm at the drawing board. "It's great", he said, "but lose the cheetah and the boat". I agreed and started working on the final piece. 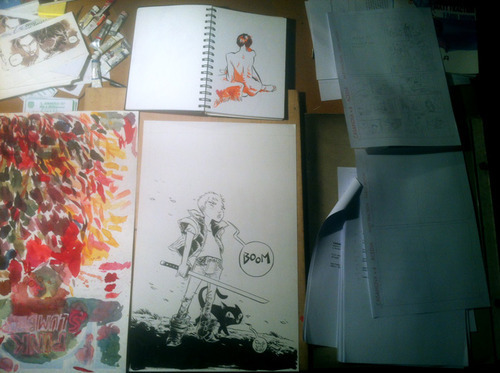 I took pictures of the process to post on twitter, and it's a great way to see the way I was thinking visually, how I left many decisions for the inking stage, how I helped to make the characters pop by using cool darker colors on the background, how the red elements united the characters, how dripping and large expressive brushstrokes help give it a "drawing" look, a "hand-made" look. After it was done, dry and ready, I scanned it, adjusted the colors on photoshop and sent it over by email. The original will be going with me to San Diego, where I shall say farewell to this painting, hoping it will find a great new home on the collection of some lucky fan. The original is being auctioned to help Usagi's creator, Stan Sakai. 9 days to bid on it and take the piece home and help out on a great cause at the same time. Details of the auction here. This artwork will be published in the upcoming Dark Horse Comics special book, "THE SAKAI PROJECT; Celebrating 30 Years of Usagi Yojimbo", Being release in July, 2014 (at San Diego Comic-Con) with all proceeds also going to Stan & Sharon Sakai. At last, the Daytripper Deluxe Edition HC is here! We're very proud of it and we know how much the readers have asked for a premium version of our beloved book. 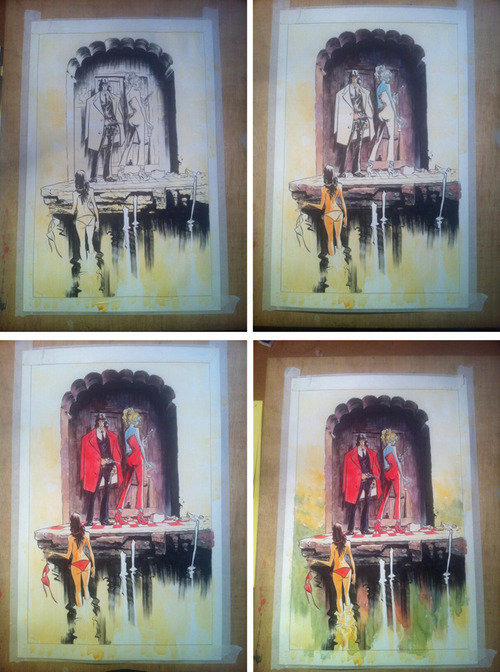 You can see a step-by-step of the new wraparound cover image here and Comics Alliance has a preview of the Sketchbook section here. And a little video of the book. We couldn't be happier. This really push us to keep telling our stories. We love comics. And a big thank you to all our readers. They made this possible. This book is for all of you. I love surprises. They fuel my creativity and challenge my work. I love when things I could have never imagine happening do happen. Daytripper keeps surprising us. University of Tennessee has chosen Daytripper for the 2014 Life of Mind program, a program to help first year students transition successfully into college. All freshman students – around 4500 – will get the book in August, then be asked to present a little essay about it and then participate on small group discussions about the book and its themes. 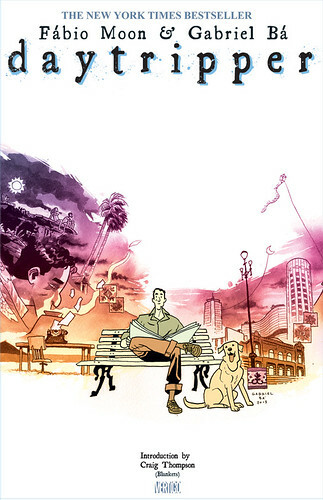 Daytripper is the first graphic novel ever to be selected for the Life of Mind program. The official announcement has been done last monday, April 7th. How did we get to India? Here's a video with our full presentation at Comic Con India, in New Delhi, last February. We talked about all the choices we've made throughout our careers that led us to this point. Even though we have now a very successful international career (quite unbelievable, really), the core of what we do remains very much the same from where we started almost 20 years ago. We had a great time at the convention and we learned a lot with everyone we've met there. We can't wait to go back. As guests of the 4th Annual Indian Comic Con, we'll be in New Delhi from February 6th till February 9th, and we'll be at the festival at various times all three days. Come say hi, bring your copy of our favourite book, or find us at the festival to buy from us some of the exclusive stuff we'll bring along with us. It's an incredible opportunity to cross the world and discover a new culture. We figured Daytripper and Umbrella Academy, being our most popular books, are more well known, so we'll be bringing with us a few copies of our independent comic Atelier, along with a few copies of our books Ursula and De:TALES. 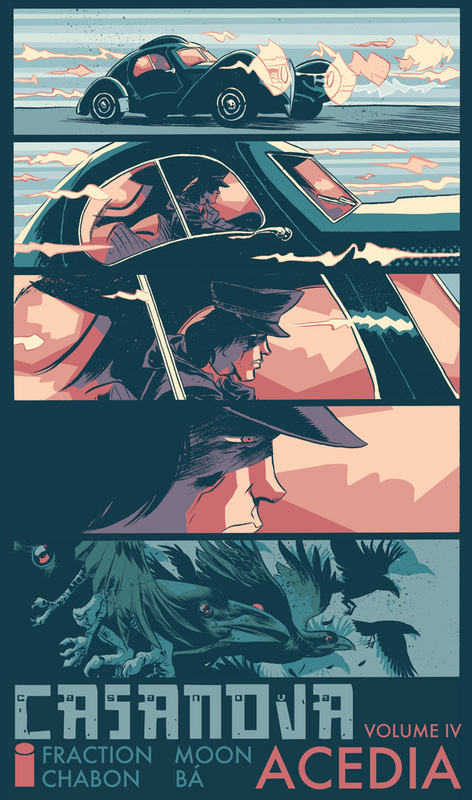 We'll have a few copies of our favourite posters to sell as well: Daytripper, Umbrella Academy, Killjoys and Weapon X. On Saturday, February 8th at 4PM, we'll have a panel to talk to the fans, tell a little bit about our journey, our passion for comics, how we ended up doing the books we did, and to answer questions from the audience. 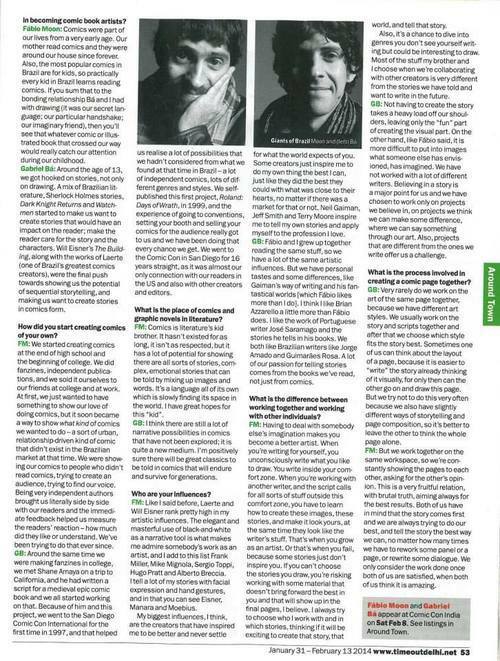 Time Out Delhi interviewed us last week. You can also read our answers in the image below. After the festival, we'll dive into the heart of India for a week before getting back to work. See you in a bit, I hope.